Traditionally an Advent Calendar always starts on the 1st December and runs till the 24th and traditionally there is a new gift every day, hidden behind the doors. 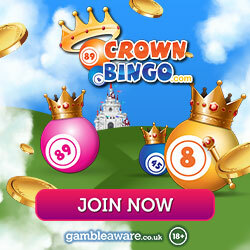 There are many online bingo sites in the UK offering Advent Calendar promos and Crown Bingo is no exception. Their Advent Calendar will run til the 25th December. I must say it was an exciting feeling to click on day number "1" and find a message telling me that my "Christmas Count Down Starts Here!" To get the snowball rolling, they have started the countdown with a Christmas Prize Draw. The prize is £20 worth of Bingo Bonus and five lucky randomly drawn winners will receive this prize. Don't forget to deposit – you need to be a depositing member to play and if you think you can peek forward behind the doors; think again, they have locked them up so you have to come back every day to see what's on offer. There are lots of different Christmas gifts up for grabs to help you get into the mood. As well as the Christmas Prize Draw this bingo site has the Top Christmas Gifts for Girls and this is their festive Weekly Prize Bingo. They are giving away a range of the top rated gifts for little girls for this season and these are valued at £150. Tickets for this game which plays on a Wednesday at 9pm in Room 2, cost 50p each and can be purchased now from the pre-buy section of the site. Take part tonight when the first game plays, but don't miss out on it, as all through the season, it will be playing every week. You will also find all the regular bingo games playing and the Cash Cow and is currently worth over £62,845!